A legal battle over a proposed wind farm of 63 turbines is brewing in a small community in the Thumb area of Michigan. Members of the Juniata Township planning commission voted to approve a special land use request by wind turbine supplier NextEra Energy Resources. Subsequently, a group of residents asked the township board to adopt a moratorium on wind farm developments so the community could revise a wind zoning ordinance adopted in 2010. When the board refused, residents gathered enough signatures to recall three of its five members. A fourth board member was targeted for a recall, but the Tuscola County election board rejected the petition language. Garrett Tetil, one of the leaders of the recall effort, told Michigan Capitol Confidential he will likely sue the township over the special land use permit. Some communities welcome wind farm developments, but in others, proposals for wind farms have led to legal and political strife. According to state law, local zoning ordinances must protect the “health, safety, and welfare” of residents, but communities can’t create “exclusionary zoning” ordinances that effectively ban an otherwise legal activity. Some wind farm developers have sued communities, contending that their zoning ordinance is too restrictive. Their lawsuits are not always successful, and in 2017 a U.S. District Court judge ruled that a moratorium on further wind development can be permissible in some situations. If NextEra is successful in getting the wind farm approved, Juniata Township would see 31 wind towers erected, 486 feet tall from base to blade tip. Neighboring Fairgrove Township, which gave its approval last fall, would see 32, according to a report from MLive. The project, spread over the two townships, would be the third wind farm developed by NextEra in the county. DTE Energy, which already purchases electricity from two NextEra wind farms in the county, plans to add 4,000 megawatts in renewable capacity over the next few decades. While DTE says it plans to get that capacity from a number of different sources, a conservative estimate is that it will need hundreds of additional wind turbines to hit that goal. Wind turbines from General Electric produce between 1.7 to 4.8 megawatts. "The 4000MW of renewable energy we will add to our portfolio will be a combination of wind and solar. It is premature to speculate on how much of each we will build and what capacity may be for future wind turbines or solar arrays," said Cindy Hecht, a spokesperson at DTE Energy. In 2008, then-Gov. Jennifer Granholm signed legislation creating a mandate called the “renewable energy portfolio standard” that requires the state to get 10 percent of its electricity from renewable sources by 2015. In 2016, Gov. Rick Snyder signed legislation mandating the state get 15 percent of its energy from renewables by 2021. Wind turbines accounted for about 53 percent of renewable energy generated in Michigan in 2016, according to the Energy Information Administration. The dispute in Juniata Township began in Nov. 2017 when officials received a special land use permit request from NextEra Energy. The township sent out a notice to residents notifying them of the request, as well as an upcoming meeting covering the permit. Tetil was shocked when he received the notice of the request because, he said, he believed that the township was too close to the Tuscola Area Airport for any wind turbines to be constructed. When the township board failed to approve a wind turbine moratorium, Tetil hired an attorney. He said he believes the township’s wind ordinance does not require adequate property-line setbacks or noise limits for wind turbines. The current zoning requires a setback of 1 to 1.5 times the height of the tower and sound levels to not exceed 65 decibels. 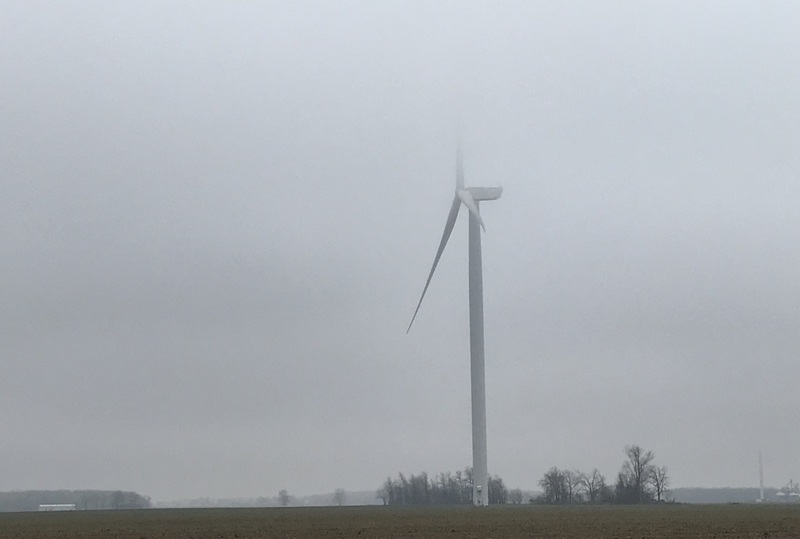 Nearby Huron County limits noise levels from turbines to an average of 50 decibels from 7 a.m. to 10 p.m. and 45 decibels the rest of the day. According to the Michigan Public Service Commission, a majority of the state’s wind developments are in the Thumb region. Huron County has the most wind developments in the state and Tuscola County has the second most. NextEra Energy did not respond to an and email and phone call requesting comment. Juniata Township Clerk Heidi Stark declined a request for comment.